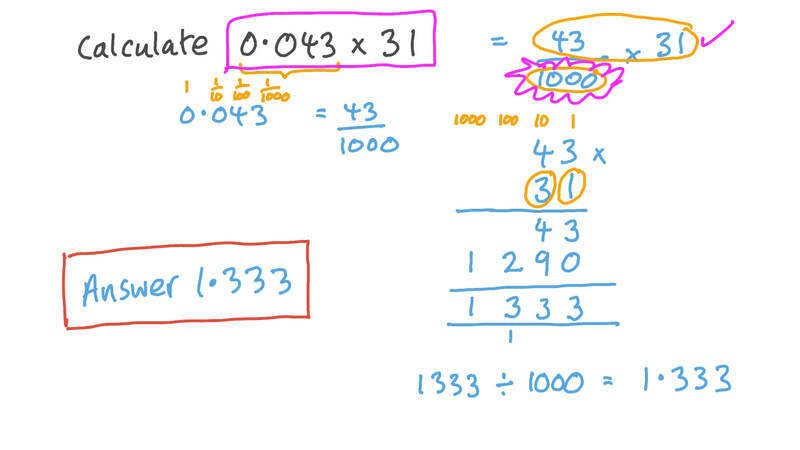 In this lesson, we will learn how to multiply decimals up to tenths, hundredths, and thousandths by whole numbers. Calculate 0 . 0 4 3 × 3 1 . 6 × 0 . 4 = . Calculate 0 . 0 3 7 8 × 3 4 . 9 . 4 × 7 = . 2 . 5 8 × 4 = . Calculate 3 . 7 8 8 × 9 8 . 4 . 2 4 6 9 × 1 , 0 0 0 ≈ to the nearest whole number. Evaluate 1 8 . 9 7 𝑎 if 𝑎 = 4 8 . Calculate the area of a rectangle whose side lengths are 16.26 cm and 14 cm. A rectangle has a length of 23.73 cm and a width of 10 cm. What is the area of the rectangle? Give your answer correct to the nearest square centimetre. The monthly salary of an employee is 825.59 LE. What is the total salary he earns in 7 years? Given that 1 2 7 × 6 9 = 8 7 6 3 , what is 1 . 2 7 × 6 9 ? Calculate 6 . 2 1 5 4 × 1 0 , 0 0 0 . The price of a bar of chocolate is 7.50 LE. What is the cost of 5 bars of chocolate? A man bought 7 metric tons of iron for building a house. The iron cost 5.90 LE for one kilogram. How much did the man pay? 4 × 0 . 7 = . 0 . 3 4 5 × 8 8 8 = . A pack of crackers costs $1.50. How much will 45 packs of crackers cost? Is this an estimate or an exact value? Carry out the given calculation.